Our Helix Luxe Mattress Review for 2019 - Pros and Cons Revealed! Looking for a bed that feels like it was designed just for you? Helix’s founders believe everyone sleeps differently, so they relied on customer feedback to create a wide range or feels with specific position preferences and body types in mind. Their handy Sleep Quiz allows shoppers to choose the bed that most aligns with their needs and preferences. This in-depth Helix Luxe review will look specifically at the Midnight version, designed to be a universal mattress with a Medium feel and side sleeper support built in. We’ll provide scores on comfort, cooling, and more, so you can determine how well this product will match your priorities. Keep reading for our comprehensive review of this product. Or skip to the end for our final thoughts and scores. To read our review of the standard Helix line, click here to see a breakdown of the Dusk model. Want enhanced temperature control – The proprietary Ultra-Cool phase-changing cover is included with all Luxe products. Gel inside the comfort foam and individually pocketed coils should further enhance airflow and temperature regulation. The cover also contains a plush pillow top for a soft, luxurious feel. Are seeking guided customization – Helix provides a guided quiz that is designed to match shoppers with one of their 9 original and 6 Luxe products that should best suit their individual needs. Enhanced support and pressure relief – The Luxe line features zoned materials that should provide solid support under the head and feet, with gentle pressure relief for the hips and shoulders. This should promote proper spinal alignment and enhance comfort. Like a ultra firm feel – The pillow top on the Luxe models is made to cradle your shape in a luxurious feel and comfortable sleep with enhanced pressure relieving properties, but those who prefer to float on the top of an ultra firm mattress may prefer the firmer options of the standard Helix. This is a bed-in-a-box hybrid using coils and foam. The bed can be used on any solid surface including adjustable frames, the floor, and bases with slats no more than 5 inches apart. Proprietary foundations, frames, and adjustable bases are available through their website. The cool and plush polyester Ultra-Cool Premium Pillow Top has been treated with phase-changing technology and should allow a luxury feel and temperature regulation. The proprietary Ultra-Cool Mattress Cover was previously available as an add-on to the Standard beds and is now included with the Luxe versions. The Luxe version of this cover cannot be removed and washed like the Standard version as it contains the pillow top. Each Luxe mattress is 14 inches in height. Convenient handles should make moving your new bed a breeze. All Luxe mattresses will vary slightly in their construction as they are each designed to cater to specific types of sleepers’ needs. The first layer utilizes Gel Visco foam to further enhance cooling properties and promote soothing pressure relief. The second layer contains Memory Plus Foam. This is a 2-inch material that is designed to adapt to your body weight to provide personalized relief and support. The third layer is a High-Grade Polyfoam that should provide a comfortable transition between the comfort and support materials. The fourth layer is comprised of 1000+ Wrapped Coils standing at 8 inches in height. These individually pocketed coils are zoned to provide support or pressure relief where your body needs it most. The shoulders should experience soft sinkage while the hips should be firmly supported to promote proper spinal alignment. 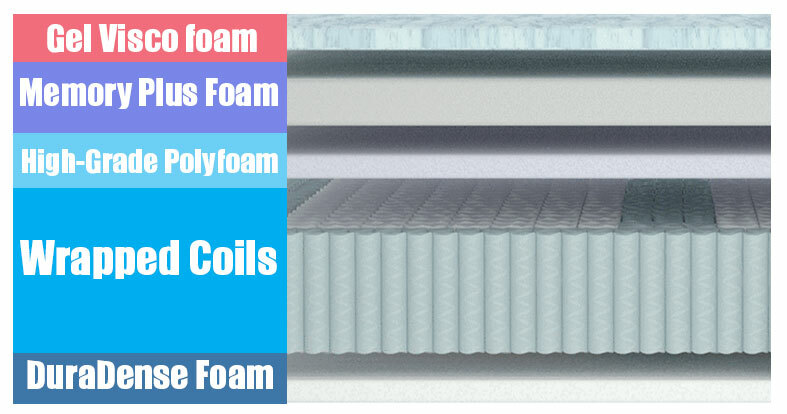 The bottom layer is a DuraDense Foam that should provide stability to the overall sleep system and help to absorb motion from the coil system above. Helix offers a wide range of products that fall between 2 and 9 on our comfort scale that sees 1 as feather soft and 10 as rock firm. 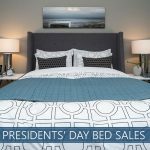 The company offers 6 total Luxe options and 9 total products so buyers can be sure to find the bed that suits their individual needs. Try using the Helix Sleep Quiz to determine which comfort level should work best for you. The Midnight Luxe falls between a 4.5-5.5 on this scale, which should feel like a true Medium to slightly Medium-Soft to most sleepers and should suit most position preferences. This is designed to offer enhanced relief to side sleepers, according to the company’s website. The Dusk Luxe is intended to provide a more universal Medium experience for all sleepers, though this product should also work well for most sleep types. You should notice a gentle cradle as you sink into the pillow top cover. Once the comfort foams become activated, the zoned construction of this product should allow some body parts to sink slightly while others should be more firmly supported. This should provide a neutral spine and enhanced pressure relief. This item should provide good bounce in the deeper latex and foam material. The materials should reshape quickly. This should make this product a good fit for combination sleepers or anyone who doesn’t like to feel “stuck” in their mattress. Most back sleepers should enjoy solid lumbar support and a neutral spine. Those who enjoy a medium or slightly softer experience should consider this version. Stomach sleepers typically require firmer support around the mid-section to prevent too much sinkage in the hips. While this item is not quite so firm, the zones should allow stomach sleepers to be well-supported by this bed. If firm support is a major concern, consider the original Twilight or Luxe Dawn options. Side sleepers should be served well by this mattress, as Helix designed this medium comfort level specifically with these types of sleepers in mind. They should experience sinkage in the shoulders and support in the hips that should allow for proper spinal alignment. The company recommends a weight limit of 350 pounds for an individual shopper or 500 total pounds for the entire mattress. Those with considerable weight concerns can opt for the Nightfall, which is designed to hold up to 500 pounds for a single person or 1,000 pounds total. There should be very little motion transfer present in this product compared to most bed-in-a-box hybrid models. The dense materials should absorb vibration and help dampen movement that may travel through the coil system. Couples should experience fewer disruptions due to motion transfer on this bed. Helix products perform above the industry standard in this area and their Luxe product line only improves on this. These beds feature reinforced perimeter coils that should further enhance edge support and maximize the usable sleep surface for couples and co-sleepers. Multiple Firmness Options – The company offers 9 different comfort options, 6 of which come in both Standard and Luxe versions. A Sleep Quiz is provided on the website to ensure you choose the right bed to suit your needs. Trial Period – Shoppers can get a feel for their new bed with the company’s 100-night trial. Warranty – Helix offers a 15-year warranty. Shipping – Shipping is free within the United States. The company also ships to most of Canada. OEKO-Tex® Certified – This product is certified to contain acceptably low levels of harmful chemicals and is safe for children to use. While this product was designed with side sleepers in mind, people of all position preferences should find the zoned support and relief conducive to a comfortable sleep experience. This item should provide both pressure relief and support thanks to zoned sections, sturdy coils, and gentle foam materials. Co-sleepers should appreciate excellent edge support and enhanced motion control. Feel confident in your purchase with Helix’s simple, guided Sleep Quiz that will work to match you with your personalized comfort experience.